Bruce Timm's latest entry into the DCAU, Justice League: Gods and Monsters, features a pretty radical new version of DC Comic's trinity. But they aren't just coming to animation — the new iterations of Wonder Woman, Superman and Batman are also getting some lovely Toys from DC Collectibles. What's interesting to note is that these are the first "animated" toys from DC Collectibles that aren't tied to the Batman cartoons, although still strictly within the Bruce Timm style. Does that mean we could get more down the line? Good lord, I would totally buy a Justice League/Justice League Unlimited line. That would be great. 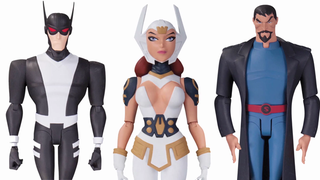 The first wave of Justice League: Gods and Monsters figures will be available in Autumn — presumably for the same price the other animated series figures sell for, $25 each.